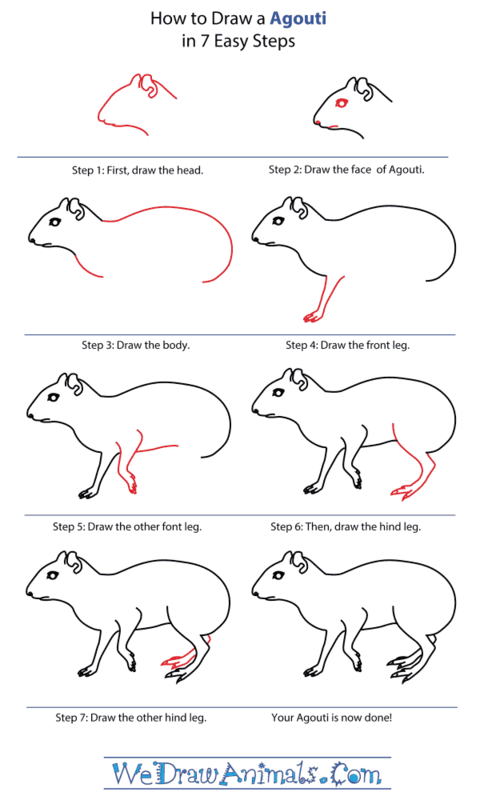 In this quick tutorial you'll learn how to draw an Agouti in 7 easy steps - great for kids and novice artists. 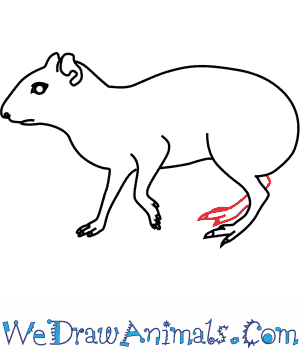 At the bottom you can read some interesting facts about the Agouti. 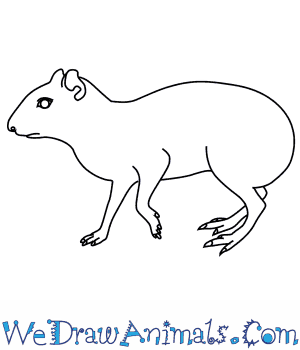 Step 1: Let's draw an agouti! Trace a line going across the bottom, then trace the line up into a slope, for the face. 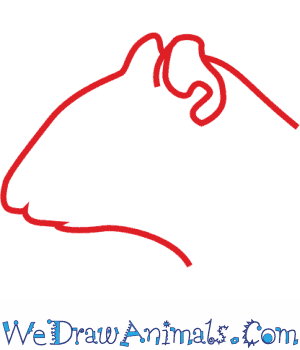 Trace the shape of the ears, making sure you draw in the first one for more detail. Step 2: Draw a short line at the front of the face for the mouth, and a small dot right above it for the nostril. Draw an oval with a circle inside it for the eye. Step 3: Trace a long curved line going across the back, making sure to curl it back to the front. Draw a short, curved line along the front for the neck. There's the body! 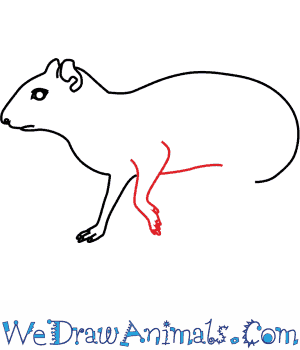 Step 4: Draw the first front leg by tracing two short lines that end with a small paw. Make sure the leg is skinny. Step 5: Draw the other front leg in zigzag pattern, starting the lines wide apart at the top, and ending in a skinny paw that is lifted off the ground. 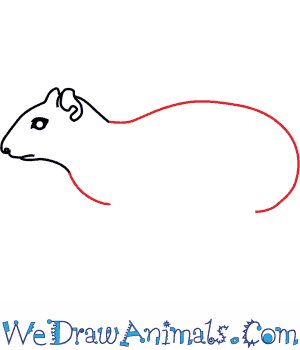 Step 6: Draw a line for the belly, and finish with a hind leg. For this leg, the toes are much longer than the front leg. Step 7: Draw the last leg, making sure to keep it hidden behind the other hind leg. There's your agouti! Agouti is actually a descriptive term for a family of rodents. 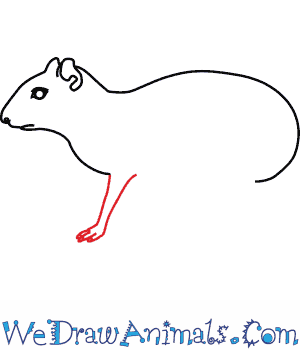 The term “common agouti” actually refers to multiple types of rodents that all share the same traits. 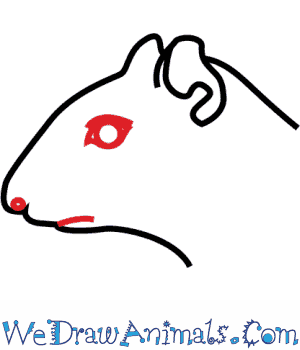 For example, agouti rodents are commonly found in Middle, North and South America. 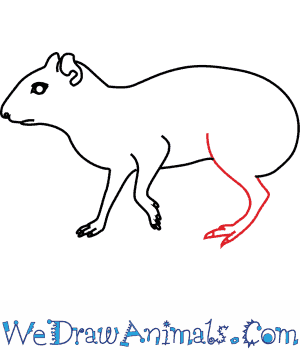 They also look a lot like guinea pigs, but the agouti are bigger and have longer legs. Agouti coats come in a bunch of different colors. Some of the more common colors are brown, red, orange, grey or black. They usually have light-colored bellies. Agouti tend to be afraid of humans, however they can be tamed. Forests are where agoutis most like to make their homes. You can usually find them in fields, rainforests, and savannahs. Like squirrels, agoutis eat while sitting on their hind legs and holding their food in their front paws. Sugarcane and banana crops are often damaged from the agouti feeding on them. Sometimes, agoutis form groups of as many as 100 members while feeding. That’s a big dinner party! Agouti babies are born in burrows that their parents line with leaves, roots, and hair. Agoutis have long life spans, and they can live up to 20 years.